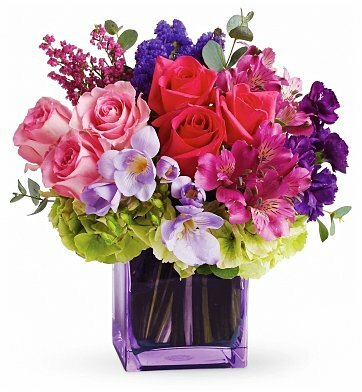 Brilliant blossoms are gorgeously arranged and delivered in an exclusive lavender vase. Let them know how special they are to you by sending this fabulous gift. Mini Purple Carnations, Eucalyptus and more. Standard Arrangement Measures 10" x 11". Same day delivery is available if you place your order by 2pm in your recipient's time zone, M-F and by 12pm on Saturday. To see if Sunday delivery is available in your area please contact customer service. if ordered by 1:00 pm EDT Saturday April 20th. Exquisite Beauty is a hand delivered gift. These gifts are delivered by one of our local design centers located throughout the United States and Canada. Same day delivery is available for most gifts when ordered before the cutoff time. The cutoff time for Exquisite Beauty is 10 AM in the recipient's time zone. Gift Tree is my 'go to' for gifts - you are amazing! This bouguet was delivered within the hour of when I ordered it - from Alaska to Colorado! And it was beautiful!! You are always where I look when I need something special! Thank you for having great customer service and quality products! The flowers arrived on the day as promised and the recipient was extremely happy with the bouquet! She sent me a picture and i was impressed by the choice of flowers and the presentation. Beautiful. The only regret I have is I couldn%u2019t choose the colors I wanted ( it was to be a gender reveal and I wanted to have some blue flowers in with the pink as well). But nevertheless the bouquet was very much appreciated and lovely!! I definitely would order again! The flowers were absolutely beautiful and exactly what I wanted. I would recommend this flower place to anyone who is wanting gorgeous arrangements. Delivered to a colleague as a get well - same day delivery and beautifully presented. Thoughtful and gorgeous! Thank you!